NEW YORK (AP) Aaron Hicks hit three home runs and the New York Yankees pummeled David Price again, connecting five times in the first four innings Sunday night on the way to an 11-1 rout of the Boston Red Sox. Matt Duffy hit a two-out, two-run single in the seventh inning that put the Rays ahead 2-1 and Mallex Smith homered in the eighth. Evan Gattis homered twice for Houston. SEATTLE (AP) – James Paxton limited Kansas City to two hits and struck out 11 in eight innings and Seattle beat the Royals for its season-best seventh consecutive victory. Paxton (8-2) also allowed two walks. From Ladner, British Columbia, pitched on Canada Day – and his bobblehead day at Safeco Field. Edwin Diaz struck out the side in the ninth for his 32nd save. Kansas City rookie Brad Keller (2-3) allowed six hits in eight innings. He allowed only one extra-base hit, Kyle Seager’s double in the seventh inning. The only run came in the second inning. Ben Gamel dropped a broken-bat single into shallow center to score Kyle Seager from second base. OAKLAND, Calif. (AP) – Francisco Lindor homered and hit two of Cleveland’s 11 doubles and the Indians ended Oakland’s six-game winning streak. Edwin Encarnacion also homered and Jose Ramirez, Yonder Alonso and Lonnie Chisenhall each added two doubles. The Indians nearly matched the team record of 12 doubles set against Minnesota in 1996. Alonso had four hits and three RBIs. Cleveland broke open the game with an eight-run eighth inning – its first 10 batters reached without an out. Mike Clevinger (7-3) allowed three runs over six uneven innings as the AL Central leaders avoided a sweep. The Indians were outscored 10-3 in the first two games of the series and were on the verge of being swept for the second time this season before breaking out against A’s starter Frankie Montas (4-2). ARLINGTON, Texas (AP) – Matt Davidson hit a two-run double in his second straight three-hit game to lead Chicago past Texas. Avisail Garcia had four hits,and Davidson and Jose Abreu drove in three runs apiece to help the White Sox avoid a sweep to start a 10-game road trip, their longest of the season. Texas’ Shin-Soo Choo extended the majors’ longest on-base streak this season to 42 games. He returned after missing a game with a strained right quadriceps that the club said will limit him defensively for a few weeks. He was 0 for 4 as the designated hitter with an eighth-inning walk that kept alive the third-longest streak in club history, and longest since 1995. Choo’s 12-game hitting streak ended. Reynaldo Lopez (4-5) made it through 6 1/3 innings in the boiling Texas heat. One-time Texas closer Joakim Soria got five outs for his 12th save. Cole Hamels (4-7) was the loser. PHILADELPHIA (AP) – Pinch-hitter Andrew Knapp homered just inside the right-field foul pole in the 13th inning to lift Philadelphia past Washington. The Philles took three of four in the series, with all the wins by one run. The Nationals are 6-15 in their past 21 games. Knapp turned on Justin Miller’s fastball and lofted it into the bleachers in right field. Miller (5-1) gave up the run in 1 1/3 innings of work. Nick Pivetta (5-7) got the win with a scoreless inning. CINCINNATI (AP) – Jose Peraza kept up Cincinnati’s parade of grand slams, sending Matt Harvey and the Reds over NL Central-leading Milwaukee. Peraza connected in the sixth inning for the Reds’ ninth slam this year, tying the season franchise record set in 2002. 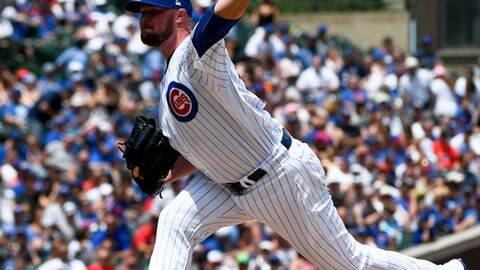 It was Cincinnati’s second in two games and third in the last eight – pitcher Mike Lorenzen had a pinch-hit slam Saturday, and pitcher Anthony DeSclafani went deep with the bases loaded on June 24 against the Cubs. The last-place Reds have won 11 of 14, and the last eight of 11 against teams that were in first place when their series started. Harvey (4-5) allowed two hits in 5 2/3 innings and won his third straight start. Peraza hit his first career slam, tagging reliever Aaron Wilkerson. Freddy Peralta (3-1) took the loss. MIAMI (AP) – Steven Matz and three relievers combined on a four-hitter and New York beat Miami to escape the NL East cellar after a one-day stay. The Mets, who endured their worst June ever, won for only the second time in the past 12 games. Matz (4-5) pitched 5 1/3 innings and allowed only an unearned run. He also singled for his first RBI of the year. New York’s bullpen leads the majors in losses but limited Miami to one hit in the final 3 2/3 innings. Jeurys Familia pitched a perfect ninth for his 15th save. Asdrubal Cabrera hit his 14th homer off Dan Straily (3-4). Todd Frazier had two hits and scored three times, and Kevin Plawecki doubled home New York’s first run. Matz was 2 for 26 this year before his two-out RBI single in the fourth put the Mets ahead 3-0. ST. LOUIS (AP) – Mike Foltynewicz threw five shutout innings and Freddie Freeman homered in Atlanta’s victory over St. Louis. Foltynewicz (6-4) gave up one hit – a fourth-inning single to Marcell Ozuna. He struck out nine and walked three in an 86-pitch outing. John Gant (2-3) took the loss. The Braves outscored St. Louis 22-10 in sweeping a three-game series in St. Louis for first time since May 11-13, 2012. Tommy Pham homered for St. Louis. TORONTO (AP) – Nick Castellanos hit his fourth career grand slam, Jordan Zimmermann pitched seven strong innings and Detroit beat Toronto to snap a snapping an 11-game losing streak. JaCoby Jones hit a two-run homer to help the Tigers won for the first time since June 17. Niko Goodrum had four hits and Jose Iglesias had two hits and two RBIs for Detroit. Zimmermann (3-0) allowed one run and five hits in his third start since returning from a shoulder injury that caused him to miss more than a month. Wearing red jerseys and caps for Canada Day, the Blue Jays couldn’t deliver a win for the holiday crowd of 37,445.